The apartment is a railroad-style one-bed in Greenpoint, on the North Williamsburg side. 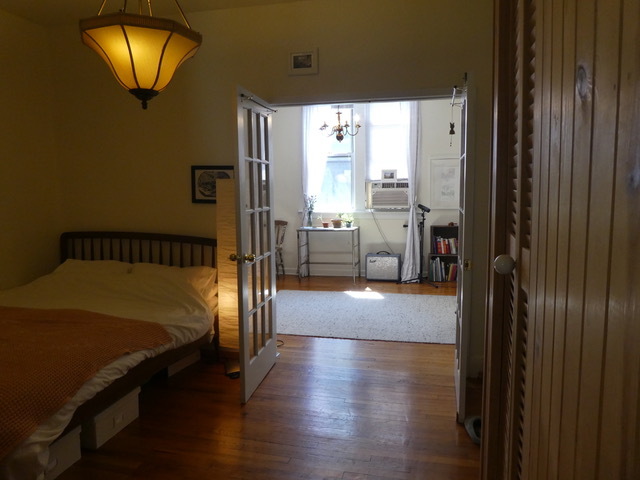 It's a 5-minute walk to McCarren Park, McCarren Pool, basketball courts etc, and 10 minutes to McGolrick Park. 5 mins walk from Nassau Ave G, 15 mins from Bedford Ave L.
The neighbourhood is full of delis, bars, restaurants and stores, it's incredibly convenient. Within the same block as the apartment are a grocery store, laundry shop, tailors, cafe, and bike shop for all your needs. Manhattan Ave is extremely nearby, including bars and cafes and shops like Five Leaves and Beacons Closet. It is a great, peaceful place, lots of books, and I have an electric piano if you want to get good at scales. Also, crucially, there is Netflix/ Amazon Prime. I'm not sure about the square footage, so I've made an approximation. Please feel free to ask to view. I'm a writer and musician, and I am subletting so I can visit my parents abroad. I would ask for the full sum on the day you get the keys, via a trusted method such as Paypal or Venmo.